Assuming that your site traffic has a value, such as newsletter sign-ups, e-commerce transactions and leads, there are great gains to be made by SEO and content aligning their objectives and strategies and collaborating on tactical delivery. This is because your search team can define which keyword queries drive commercial traffic, whether your brand/client get any of that action and what you or they might have to do to improve rankings. That might include links, high-quality content, building topical authority, adjusting site architecture and schema or a combination of all of the above and more. Your content marketing team know your audience and they know how to create high-quality content campaigns. They also know where to focus energy in order to drive engagement. Search teams need content to realise some of their recommendations, and content teams need insights and the most lucrative objective to drive activity – as well as the associated KPI. Fictional start-up Burroughs Wellness wants to sell 50% more of their wearable fitness trackers. Burroughs Wellness sell a health and fitness wearable on their website. They have limited brand awareness and don’t rank for their commercial keyword: ‘fitness tracker’ for which there are 168,000 monthly searches globally. Their revenue from organic search is almost nothing. The content marketing team come up with a creative campaign to position the brand as the edgy, cooler peer of the Fitbit and Apple Watch: Social media, display, video, print and PR. The search team can see that the keyword is a hard one to rank for, so they know they will need large quantities of links for any page to rank for ‘fitness tracker.’ This, in addition to simple content creation for easier-to-rank-for long-tail searches, such as ‘best budget fitness tracker’, ‘waterproof fitness tracker’ and ‘fitness tracker with GPS’. They recommend traditional link-building. The Marketing Director reads an article like this one, and gets his teams to start again and collaborate on a digital strategy. The content team says that they’re going to boost the brand’s awareness and drive traffic for branded search. The search team says that if they can rank for ‘fitness tracker’ they don’t need brand awareness because they will reach people interested in (buying) a fitness tracker at the point of interest and purchase in search results – there are, after all, 168,000 people already looking for the item. Content marketing feel a little crestfallen and say, ‘sure, so how do we do that then?’. ‘So,’ says the content team. ‘We just have to define what earns high-quality links for this topic’. The search team uses a tool like Ahrefs to see what content gets the most links and the most traffic, and the content team distil it into a set of findings: popular topics, well-shared formats (tools, infographics, videos, lists, galleries), best length/word count and appealing title styles (for example: top tens, years, ‘new’, ‘best’, and ‘cheap’ lists). The data and insight shows that tools always get lots of links, followed by list guides about cheap fitness trackers, then Black Friday deals and news articles about misuse of data. The content team ideate. Rather than blue-sky, go-mad, dream-big sessions, they have a clearly defined set of creative boundaries to detail what they need to create. They’re not dreaming up experiential outdoor, social media micro-moments or brand ambassador flash mobs. They know they want to come up with an online fitness-related tool that helps people in some way, because this is the content that gets links and drives traffic. They come up with The Wearable Goal Setter – an online tool that allows you to put your personal health goals into an interactive page that gives daily goals that can be monitored by fitness trackers. The tool is developed and everyone is excited. It goes live and includes a link to the product page. 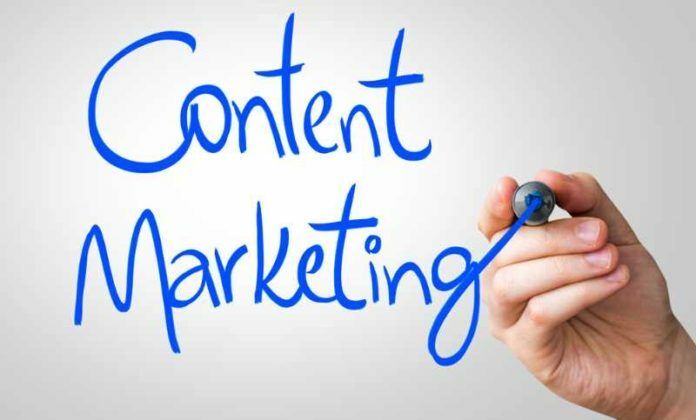 The content marketing team develop a comprehensive promotional plan that focuses on PR and outreach to earn links and coverage, and drive traffic. Promotion begins. It’s slow at first. A few small blogs cover the tool. Then a national title in Australia covers it and promotes their own article on social media. Soon, lots of local sites are covering it. The team contact the sites who covered the story but didn’t link to it, and request links. International sites begin to cover the tool, with some help from the content team who are creating related articles to give away to higher-value sites. The search team kept a close eye on the ranking of the product page for the keyword ‘fitness tracker’. The tool itself reached page two during the promotional activity, and this drove some conversions, but the product page soon caught up as domain authority grew and Google began to understand that this was the thing people were looking for by searching ‘fitness tracker’, not the tool. As the product page hit page two of Google it started to drive more commercial traffic, that converted more frequently. Continued outreach and tactical on-site content supported the effort and with every ranking position up towards the top spot they got, the site saw exponential revenue growth. As rankings went up, so did the site’s commercial traffic from search, which in turn drove revenue. A press request for an interview with the founder. This story is fictional, but everything in it relates to real events that sites and their marketing teams go through. It is a simplistic story but nonetheless shows how, by working together at the earliest stages, SEO and content marketing can move the needle further on a single objective, with a small number of KPIs that offer real ROI. Content teams’ activity can often be fragmented, offering inaccurate results from dozens of top-of-funnel metrics that feel fluffy to ‘money people’. And SEOs can struggle to think of the awesome linkable asset that will be covered by the relevant media/industry. It is important to define the opportunity: are people searching for the product or service you provide? What are the queries people use when looking to buy, and what would it take to rank for them? Get your search and content teams in a room and ask them these questions. James Gill is Head of Content Marketing at Further. With 15 years’ content marketing experience on- and offline, Gill has created and consulted on content for brands including Harley-Davidson, Channel 4, Rolls-Royce, Zoopla, Budweiser and Oxford University.You can connect with him on LinkedIn.